Cut loose and free your time with this Moksha Special Edition. The Moksha Special Edition demands attention. Like the Moksha custom bike, the design overflows with the power synonymous with Son of Time and refined with the liberating essence of Moksha. Explore more here. The Son of Time Moksha Special Edition timepiece is a bold statement in red and black. The double layered dial, brake disk styled outer ring and black leather strap with red detailing forge a powerful image that will turn heads. 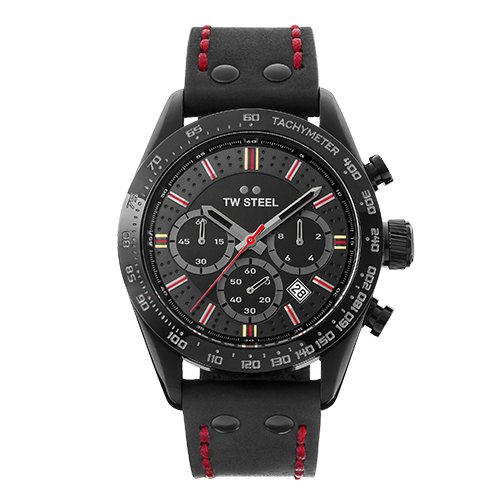 This is the first Son of Time watch that moves away from the Maverick and is built on the new TW Steel Chrono Sport, a sportive design that comes packed with the TW Steel attitude you expect. Side by side, the custom bike and timepiece vibe with vintage aesthetics, forward facing design and freedom above all else. In line with TW Steel standards, the specifications are top notch. Powered by a big calibre chronograph movement, the special edition features a 46mm 316L high grade PVD black coated steel case, a double layered dial, 10ATM, sapphire coated crystal and a premium Italian leather strap. In short, this timepiece is ready to roar. Cut loose and free your time. Crafted alongside the Moksha custom bike, this timepiece features a 46mm PVD black coated case, a double layered black dial with red accents and a brake disc styled outer ring.